What I like best is a book that's at least funny once in a while . . . What really knocks me out is a book that, when you're all done reading it, you wish the author that wrote it was a terrific friend of yours and you could call him up on the phone whenever you felt like it. That doesn't happen much, though. The late Frank Deford was one of America's greatest sportswriters. A gifted broadcaster, screenwriter and novelist, he wrote a book once about the Miss America pageant and his four years as a judge. "I was a bit nervous about judging," he recalls in his memoir, Over Time, "but then a wonderful Miss America maven, Eleanor 'Big Momma' Andrews, explained that it was really very easy. 'Honey,' Big Momma told me, 'don't worry about it. All you have to know is that the women judges just vote for the girl that reminds them most of themselves, and the men judges just vote for the one they'd most like to sleep with.'" This was my first thought when the books arrived at my door. 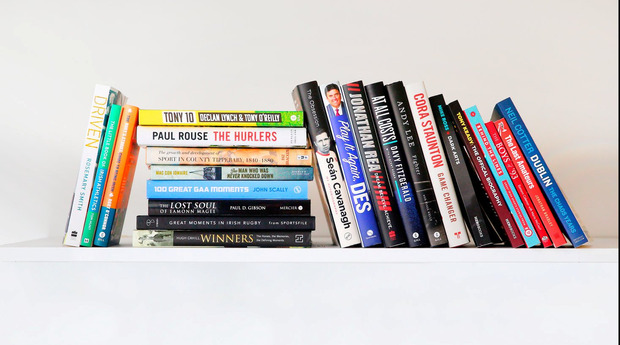 The invitation to join the judging panel for the eir sport Book of the Year had dropped in late September. A long list of entries would be announced in October. The mission (should I choose to accept) was to analyse the merits of each book, cast an initial vote for my top five via email and then meet with the rest of the panel to discuss a shortlist of three. But what if the longlist contained 23 books? What if the books arrived on October 31 and there were five to choose before November 23? What if most of the books weighed in at almost 300 pages? What if you normally took three days to read a book and had been given 23 to access in 24 days? Seven were scanned and culled immediately: Great Moments in Irish Rugby from Sportsfile was a picture book; Hugh Cahill's Winners had a lot more substance but a similar coffee-table appeal; Tom Hunt's The Little Book of Irish Athletics was speared by its title; Pat Bracken's The Growth and Development of Sport in Tipperary 1840-1880 was an academic tome. John Scally's 100 Great GAA Moments was a GAA-man's stocking-filler; Behind the Lines: Great Irish Sports Stories From the 42 did what it said on the tin and delivers some of the best pieces on sport published this year but it's an anthology; and I like Rory O'Connor but The Rory's Stories Guide to being Irish was never going to be Book of the Year. So now it's five from 16. My brother, Kevin, lectures in journalism and agreed to review the eight I was unsure or might be prejudiced against: Dark Arts (Mike Ross with Liam Hayes); Dream. Believe. Achieve (Jonathan Rea); Driven (Rosemary Smith and Ann Ingle); Dublin The Chaos Years (Neil Cotter); Legend: The Official Biography of Tony Keady (Liam Hayes); Play it Again, Des (Des Cahill with Mary Hannigan); The Boys of '93 (Eamonn Coleman with Maria McCourt); The Last Amateurs (Jonathan Bradley). I pulled The Obsession from the pile and placed it at number one; it was the only book from the list I had read and a logical and worthy front-runner. The game now was who could move ahead. What I was looking for was a reading experience; something that engaged or excited or moved me; something big or bold or brave that's beyond the game and how it's played. The Cora book Game Changer - the first autobiography of a female GAA star - is solid and well-written but lacks depth or reflection; perhaps because the subject is a complex woman determined to keep us at arm's length; perhaps because she's still playing and not ready for that yet. A less engaging read than the Cavanagh book. Next up was the The Fighter the prettiest of the pile with its stupendously glorious cover and a narrative that surprises and enchants from the opening page. The surprise is that it's not so much a memoir as a beautifully-crafted essay on what it is to fight; the enchantment is the honesty as the fighter finds love and reflects on the things that matter in life. A seamless collaboration between Lee and his ghostwriter Niall Kelly - who had steered Philly McMahon to last year's top prize - The Fighter set a standard I was convinced would not be matched. Davy Fitzgerald and Seán Mannion - aka 'The Man Who Was Never Knocked Down' - couldn't scratch it. The pick of my brother's batch - Rosemary Smith and Dublin's chaos years - were both enjoyable reads but not in the same league. Paul Rouse's The Hurlers justified the glowing reviews and moved to number two on my list in front of Driven, Dublin The Chaos Years and The Obsession. But the deal was done: The Fighter would not be caught. Tony 10 had been collecting dust since it was sent to me last March. It had the worst cover I'd ever seen and would have been culled in the batch with 'Rory's Stories' - "The guy was a postman! It's not a sports book!" - were it not for the fact that I work with Declan Lynch. I picked it up one Sunday morning and could not put it down. The Fighter or Tony 10? I couldn't choose. The Lost Soul of Eamonn Magee was one of the last on my list. I'd never heard of the author and didn't care for the subject and approached it with the same reserve I'd had for Tony 10. And got the same result - it absolutely blew my doors off. The day I finished it was the launch of On the Seventh Day - the Sunday Independent anthology - at Hodges Figgis in Dublin where I broached my enthusiasm to a friend. "You have got to read this book!" Him: "I think a better name for this book would have been: Eamonn Magee - Diary of a Scumbag. Obviously a bit less lyrical, but a lot more accurate!" Me: "Okay, so you didn't like him. I didn't like him. What did you think of the book?" Him: "Well, I'm not enjoying it because I'm not enjoying spending so much time in the company of a violent thug with almost no redeeming features. I guess it reinforces the first principle of any book or film, which is that the reader/viewer should be able to find some sympathy with the main protagonist." Me: "How was that principle established? Where is it written down?" Him: "No idea, but I guess it goes back to the start of storytelling itself, which is to say back to the time when humans first started talking to each other . . . For what it's worth, I think Andy Lee's book is in a different league. "It has a literary and intellectual quality that is almost entirely absent from the Magee book." The Lost Soul of Eamonn Magee. The winner will be announced at a luncheon in Dublin on Thursday.